New Zealanders are becoming aware of the magnitude of the earthquake that hit Christchurch last Tuesday. I mean the human magnitude – not the geological one. We had become so used to the aftershocks from the September 2010 earthquake that this one took a few hours to hit home. Now we have a nation-wide state of emergency and the death toll is rising. Its expected to be in the hundreds. We are now seeing an Erebus effect: Every New Zealander will have a family member or friend who has died or been injured. In fact, because Christchurch was a centre for tourism and education of foreign students, the personal influence will be much wider than the country itself. At SciBlogsNZ, Peter Griffin describes the losses suffered by the NZ News media in Christchurch (see Amid carnage media bears brunt of disaster). He also stresses that “the New Zealand media has actually responded impressively, with dignity and respect for the people of Christchurch.” I agree – their coverage has been very effective within New Zealand and in supplying the overseas media. This rapid and effective response by the media helped mobilise public sympathy and the huge efforts by the rest of the country to help in the search and rescue effort and support for survivors. I have also been really impressed by how quickly other countries have responded with help. 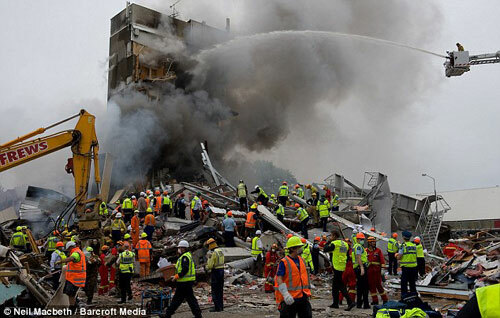 We had Australian search and rescue teams operating in Christchurch the day after the earthquake. More specialist teams are arriving from around the world. Singapore, Taiwan, Japan, USA, UK and probably other countries. Medical and police teams are also arriving. The media coverage is bringing home the seriousness of this earthquake to the rest of New Zealand and the rest of the world. And there has been an immediate response. I think this illustrates something about our species. We are basically social and empathetic. We can sympathise with the plight of others and feel their pain. We do respond automatically. And our ability to empathise goes well beyond our direct kin. In a sense technological developments have brought this about. Today news of such human emergencies spreads very quickly. People on the other side of the world can be aware of such problems within hours. And the ready availability of news, images and TV produces a reality which enhances our empathy. In a sense members of these search and rescue and other specialist teams are fortunate. In such emergencies they have skills which can be immediately put to use. Consequently these teams often operate in countries other than their own. The rest of us often feel frustrated that we can’t help more. However, there is always the need for financial help – and that is particularly appropriate in this particular emergency. Just be aware that there are a few scams out there – support the reliable charities. For example: The NZ Red Cross, or the Christchurch Mayoral Earthquake Appeal (via Give a Little). Humanity. Much better than expected. I lived in Canterbury for a couple of years and left because I couldn’t stand the locals. With a few exceptions they were unfriendly, parochial and very conceited about being Cantabrians, with overt contempt for anyone who wasn’t. I hope as a result of the outpouring of empathy and generosity from the rest of New Zealand, this will change and Cantabrians will be nicer in future, and stop regarding themselves as superior to all other New Zealanders. Well, I have lived in Canterbury for 11 years and I have found Cantabrians to be just as friendly as most other New Zealanders. I find the timing of your comments, Rosalind, to be most insensitive.